Well, I actuallly finished something! This is a little cross stitch Christmas ornament for the Embroiderers' Association of Canada (EAC) Winter Ornament Exchange. This is the first year they have had this exchange and I love the idea. 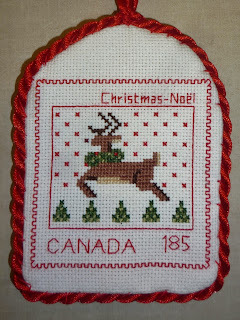 This ornament is made from a pattern taken from one of Canada's Christmas series of stamps for 2013. The stamps themselves were designed by Helene L'Heureux for Canada Post.The needlework on the stamps was created by Claire Belzil. There are three stamps in the series: the reindeer seen above, a Christmas tree, and a musical horn. Patterns for all three will be in the next issue of Embroidery Canada as well as on the EAC website shortly. I recently had the pleasure of taking a class from Marnie Ritter and we used the technique of flower pounding to prepare our canvas before we worked on it. Flower pounding is an old technique which was popular in Victorian times. No special equipment is needed for this technique. Above is an example I made on gold glitter congress cloth. Rather than the traditional way I had learned before, Marnie showed us how to use only one leaf or petal at a time (instead of pounding the entire blossom with a hammer on the background cloth). Simply place the leaf or petal where you want it on your background cloth and use a Popsicle stick or your thumbnail to rub it into the cloth. Your petal with disintegrate in the process and after you scrape it off, you will see the colour revealed beneath. Note that petals do not always give you the colour you expect them to! After you have all the colour you want on your background fabric, in this case congress cloth, allow it to dry and iron the back of it to set the colour. I can't speak to the permanence of the colour produced until my fabric has a few years under its belt but it is a fun experiment and I am working on a larger project that I will share as I go on with it. I came across this license plate in the underground parking of the hotel I stayed at in Kentucky and I love it! I like these personalized license plates and they are like little puzzles sometimes trying to figure out what they mean but this one is pretty obvious - Needlepoint! I have no idea whose plate it is but love that the owner is advertising her stitching passion!